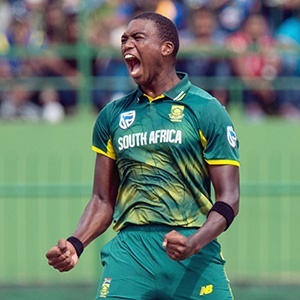 Cape Town - Proteas fast bowlers Lungi Ngidi and Anrich Nortje - both injured and out of the IPL - are still on track to make the 2019 World Cup in England. The news came through last week that both players had picked up injuries while on national duty against Sri Lanka, and while their respective IPL franchises would have been less than impressed, the real concern from a South African perspective was immediately the World Cup. Ngidi, who turns out for the Chennai Super Kings, has a side strain while Nortje – set for his IPL debut with the Kolkata Knight Riders - has a shoulder injury. Both are expected to be out for four to six weeks. While that time-frame gives them room to recuperate for the World Cup, the concerns are obvious. The World Cup squad is expected to be named on April 18 - less than four weeks away - and the possibility of selecting both Ngidi and Nortje while they are still technically injured is very real. Ngidi is expected to spearhead the Proteas pace attack alongside Dale Steyn and Kagiso Rabada, while Nortje is the front-runner to serve as the back-up to that trio. Raw pace is something that all of the above-mentioned players have, and it is not something that will be easily replaced should one, or two, of them be deemed unavailable. Beauran Hendricks and Dane Paterson, while skilful, are not naturally quick. Then there is Chris Morris, who can certainly crank it up, but he has not been part of the ODI plans for a while now. Junior Dala is another option, but he has just two ODIs to his name and it would be a big call to back him for the World Cup. Lutho Sipamla is another, but he is still some way off. Given the time that the Proteas have invested into both Ngidi and Nortje, they are the logical selections for England. Sport24 spoke to a member of the Proteas' medical team on Monday, and the feedback was that both Ngidi and Nortje are expected to prove their fitness in time for the World Cup. That would require the 4-6 week recovery period to be "uneventful", and if that is the case then both will be "fit to be considered for the Cricket World Cup by the selectors". South Africa will play their first match of the World Cup on May 30 against hosts England at The Oval in London.